A growing group of Boca Raton homeowners is prepared to go to court and fight to keep their proprieties intact. In March, a letter went out to homeowners who live on Sabal Palm Lake near Camino Real Road and SW 9th Avenue. The letter said the Lake Worth Drainage District will be planning necessary rehabilitation work on the L-49 Canal. The work included removing trees and anything in the encroachment area. Mike and Jane Jurus said they did not think their home, that sits on Sabal Palm Lake, was apart of the L-49 Canal until they got another letter a few weeks ago. “We all took a look at our backyards and realized, well, we don’t live on a canal, we live on a lake,” said Jane Jurus. They said they, along with another neighbor, have started to fight the district to stop their work. The district said in a statement that homes that live along the L-49 Canal right of way on the lake are considered a part of the rehabilitation project. Along with removing trees, homeowners are being told the district is moving their property lines. “I am being told I need to remove this fence and bring it up to its new property line all at my expense,” said Jane as she shows the 20 plus feet her property is being moved. “This is a lake, it’s on our deed as a lake, we bought it as lakefront property when we bought it,” said neighbor John McPhail. He said nearly all the trees would be removed, and he worries about all the wildlife in the area. McPhail said the neighborhood is frustrated and they are looking at what they can do to stop this. Mike and Jane are willing to take this to court and other neighbors will join them. "If it comes down to that, that is the only way to fight then that is how we will fight,” said Mike Jurus. The L-49 canal located within the City of Boca Raton has significant encroachments on the Lake Worth Drainage District’s canal right-of-way which must be cleared to ensure effective flood control and public safety. A single tree or shed from a nearby private property can end up in a drainage canal and obstruct water flow, and ultimately impact hundreds of upstream properties and residences. Sabal Palm Lake was excavated immediately south of the District’s L-49 Canal and incorporated into the community’s permitted drainage system. The properties located on the north side of Sabal Palm Lake are adjacent to canal right-of-way owned by the Lake Worth Drainage District; the canal right-of-way is not private property. Like any other canal, obstructions from adjacent properties can still impact flood control. 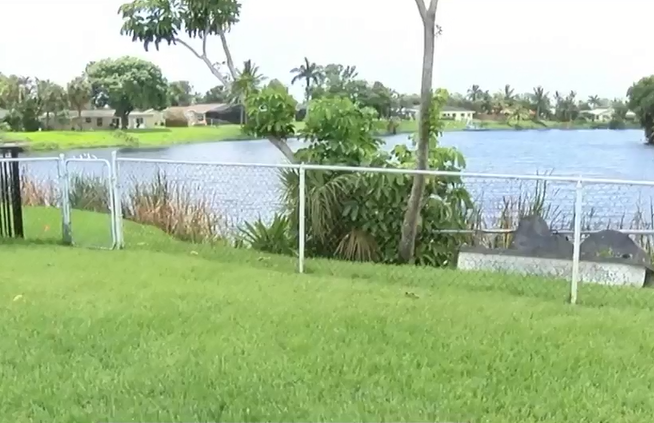 The Lake Worth Drainage District is working closely with staff from the City of Boca Raton to continue progress on its Canal Rehabilitation Program. Clearing of encroachments on the L-49 Canal right-of-way adjacent to Sabal Palm Lake has been placed on an intermittent hold allowing District and City staff to confirm ownership interests and collaborate on a mutually beneficial solution that will ensure continued flood control for all of the area residents in this area.